--Friday, September 28: Homemade Italian Wine Contest at the Italian Center of Stamford, 7pm. Reserve a space at 847-0713. -- Saturday, September 29: Display of different types of Ferraris on Bedford St., right near Capriccio and Tigin. 3-8pm. --Wednesday, October 3: Pastry sampling and film ”Italians in America.” 6:30pm, Italian Center. Reserve space: 322-6941. -- Tuesday, October 2: Italian Antipasto Table with wine tasting. 6:30 pm at the Harry Bennett Branch of the library (on Vine Rd. off High Ridge). 351-8237 for more info. 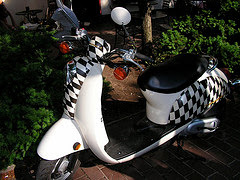 Thank you to Lanamaniac for the Vespa photo.